There’s really not much to talk about here with a bunch of words. They’ll just get in the way of you pressing play and smiling like a little kid as your brain sort of automatically speculates on the possibilities of this in peoples’ homes. We’ve all dreamed of the Holodeck being a part of our secret lair at home. Microsoft’s new IllumiRoom is a lot like watching a baby take its first steps in the direction of Holodecks becoming a standard part of any man-cave. Sure we’ve seen mapped projections before like at Walt Disney World’s Magic, Memories and You show at the Magic Kingdom…but nothing on a consumer level and nothing with this kind of customization. Using a Kinect, a couple of cameras and some software, this is something that, while in its newborn stage, could lead to some truly innovative projects and ideas…or just mean that we’re going to be leaving our mother’s basements way less than we already do. Meet Your New Running Partner – Joggobot! Jogging just got potentially exciting. Meet the Joggobot, a small quadcopter drone, from Exertion Labs. Running around town with your own drone is kinda nerdy…running around town with about four or five of these hovering around you? Badass. Joggobot isn’t available to the masses yet, but we’re willing to bet that once it is, it’s only a matter of time before the ‘maker’ community arms it with options like pepper spray or a taser, slaps some devices on it for a mean game of LaserTag, some over-achiever hooks it to the Kinect or some Comic-Con cosplayer decides to go as Booster Gold and Skeets. And, like we repeatedly mention on this blog and in the podcast, once it gets online? Joggobots world-wide will just wait for that inevitable signal from Skynet. Posted in Robot, Video Games | Comments Off on Meet Your New Running Partner – Joggobot! 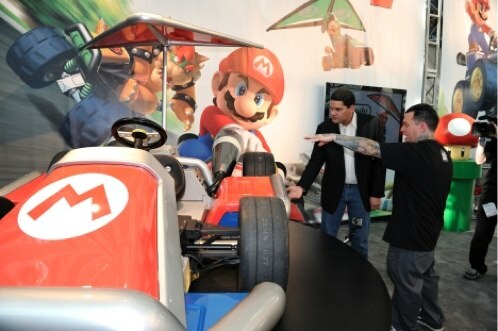 You only have a few more days, but fans of the koopa shell flinging road derby franchise Mario Kart can see life size constructions of some of the vehicles on display at the Los Angeles Auto Show. You only have until the end of this weekend, so you better hurray. Here is a video taken during the height of the plague. The end boss of Zul’Gurub was Hakkar the Soulflayer, Blood God of the Gurubashi trolls, and if he was attacked the players received a gift called Corrupted Blood, which is basically a curse that steals health and is highly transmittable from one player to another. It was originally designed to only affect the players while they were still within the dungeon, but a combination of bugs introduced into the system and player actions combined to set the plague loose into the world. The damage done by Corrupted Blood was so massive that it killed most lower level characters instantly, but allowed more powerful characters enough time to keep moving and spread the disease even further. Corrupted Blood was designed as a short-term annoyance for very high level players and was never meant or imagined to exist outside the specific dungeon for which it was created. A series of small failures combined and cascaded to become a world event. Players had at least two ways of transferring Corrupted Blood beyond the walls of Zul’Gurub. The first way was to simply teleport from the dungeon back to a populated area. Secondly, it was possible for in-game pets to get the disease as well, but they would not lose it when they left the dungeon. Corrupted Blood also exhibited asymptomatic characteristics as the game controlled characters were not affected by the plague, but they could be carriers of it. All of the non player characters (NPC) essentially acted very much like a World of Warcraft Typhoid Mary. Players, much like humans in real life, ignored the authorities. A voluntary quarantine was issued by Blizzard, but it was ignored by many players or simply not take seriously. The final factor that played heavily into the plague was the fact that many players willfully and intentionally operated to spread Corrupted Blood throughout the lands. These players have been called the terrorists of World of Warcraft by Robert Lemos of Security Focus. These four basic issues combined together to create a scenario that quickly became an out of control plague. In the end, Blizzard forced a hard reset of the servers and rolled a new version of code out that addressed issues 1 and 2 listed above. Unfortunately, issues 3 and 4 are outside the ability to be repaired and will probably show up again in the future. In more recent years, the incident has been used several times in epidemiological studies and it has even been used as a model for exploring how terrorist cells form and operate. Today, we are going to explore another question that people ask themselves a surprisingly large amount of the time. 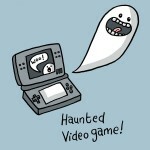 What if a video game… were haunted? Here are five times that question has been asked. Haunted video game or clever ruse to rid the house of Ms. Pac Man? 2. Pokeman Black – A bootleg version of Pokemon found in a flea market that was a modified version of Pokemon Red. The game starts out with an extra Pokemon simply called “GHOST” that had an attack called Curse. When used in battle, GHOST would slaughter any other Pokemon and when the end of the game was reached, the gamer was faced with “GHOST wants to fight!”. The battle always ended in death for the gamer and the game being erased. 3. Majora’s Haunted Mask – This legend has a really involved back story, but the basic premise is that a video game was purchased at a garage sale that belonged to a boy named Ben who had died, most likely from drowning. Check out these videos from the affected game. They are definitely creepy if nothing else. 4. Polybius, The Haunted Arcade Game – The legend of Polybius originated in Portland in the 1980s and involved a strange game that showed up at various Portland arcades mysteriously. The few gamers that actually got a chance and played the game supposedly became addicted and started acting strangely. Just as quickly and mysteriously as the game had appeared, it disappeared leaving few clues as to where it came from. Conspiracy theories range from government experiments, to ghosts, to Atari recalls. This legend is quite detailed and much more information can be found in the article and on Wikipedia. 5. Minecraft and the Legend of Herobrine – This is my favorite legend that we are covering today and it could easily be an entire post by itself. There is a lot of detail and information if you are willing to dig around the internet for it. 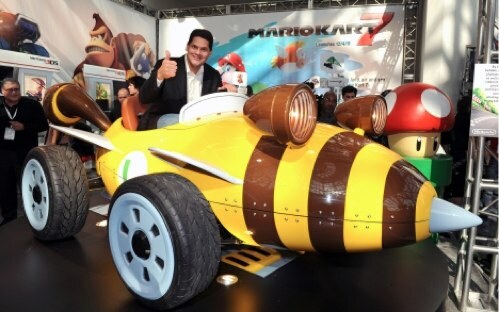 The basic premise for the legend is that while playing in single player mode gamers started reporting structures and tunnels they did not build. They would also occasionally spot a user identified as Herobrine, who it was later discovered was the dead brother of Notch, the developer of Minecraft. One of the most interesting parts of this legend to me is the hilarious and sometimes vitriolic interaction between the believers, the scammers, and those people who are clearly irritated with the whole idea. I also love the growing library of videos that have appeared on YouTube chronicling Herobrine encounters. I have embedded some of my favorite ones below. This one is long, you only need to watch like the last minute if you want. It should be noted that four of the five stories involve haunted hardware, perhaps because it is easier to attribute something intangible, like a ghost, to a tangible object you can touch. Minecraft is a shared experience; however, Herobrine is only reported in the single player version of the game, which is not shared. Even so, as the legend of Herobrine has grown, the Minecraft community as a whole has shared the experience. This has been but a small sampling of the good ghost shenanigans in video games that are out there today. Anybody know any additional stories? 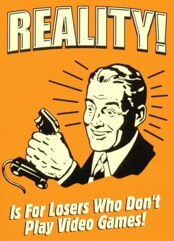 Video games, they are not just for recruiting The Last Starfighter anymore. They can also aide in controlling your dreams, according to science! That ability to shape the alternate reality of dream worlds might not match mind-bending Hollywood films such as “The Matrix,” but it could provide an edge when fighting nightmares or even mental trauma. Dreams and video games both represent alternate realities, according to Jayne Gackenbach, a psychologist at Grant MacEwan University in Canada. But she pointed out that dreams arise biologically from the human mind, while video games are technologically driven by computers and gaming consoles.